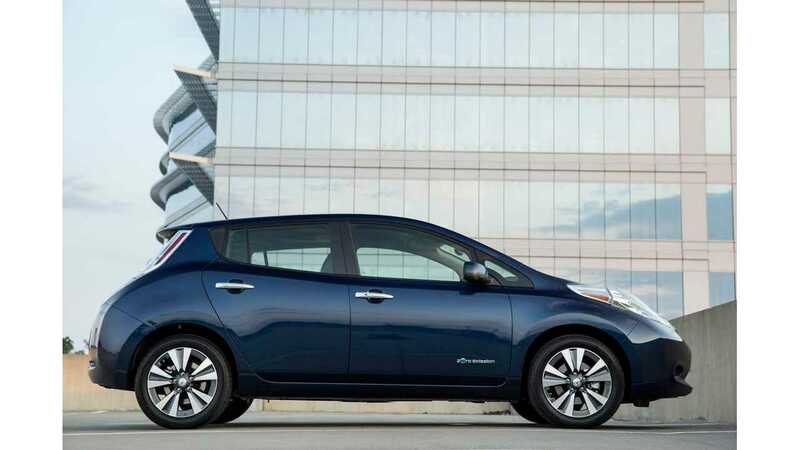 Nissan has taken the wraps off the 2016 Nissan LEAF, and the company did not disappoint on earlier range expectations as both the SV and SL trims now come equipped with a 30 kWh battery, giving the LEAF 107 miles (172 km) of EPA rated range, as well as a new 8 year/100,000 mile battery warranty. 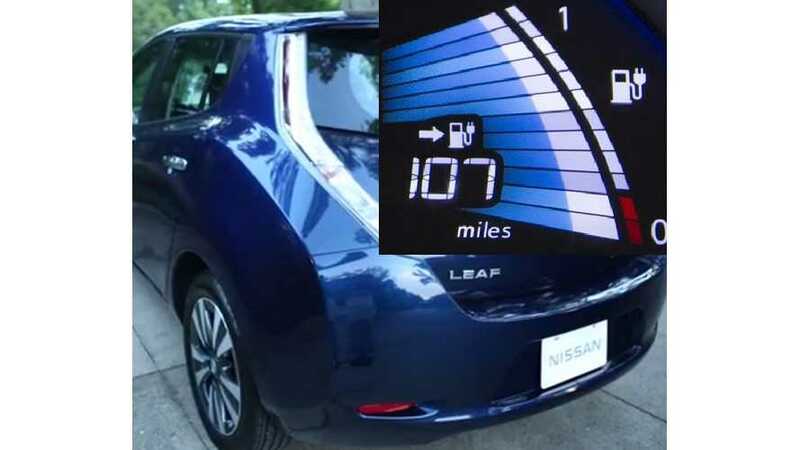 2016 Nissan LEAF - Now With 107 Miles Of Range! The base S trim level still comes with 2015 model year's 24 kWh battery, good for 84 miles of range. 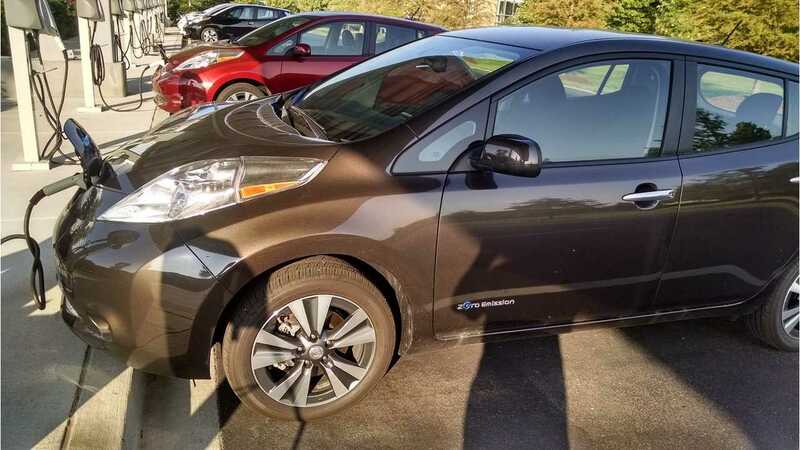 As for pricing, the base Nissan LEAF remains unchanged at $29,010 (+$850 delivery), while the extra 23 miles found in the SV and SL trims see the prices increase anywhere from $1,600 (SL) to $2,100. 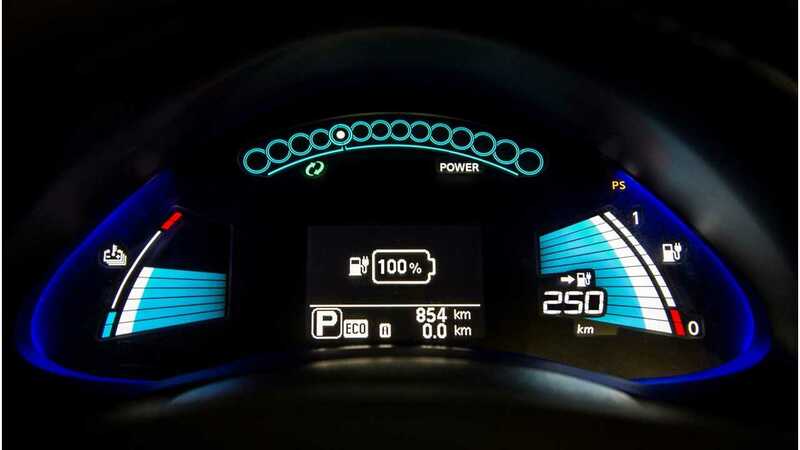 A larger battery also means a greater sweet spot for fast charging, hence all the new 30 kWh LEAFs can now be quick-charged to 80% (from the low battery warning) in about 30 minutes, which nets about 22% more miles of range over that of the base S trim. Level 2 charging stays at 6.6 kW and a full charge will set SV and SL LEAFs back about 6 hours, as opposed to 5 hours with the 24 kWh battery. Internationally: If you happen to reside in Europe, the 2016 Nissan LEAF gets a new 155 mile/250 km rating based on the NEDC system. Pricing on the longer range Acenta and Tekna trim grades has yet to be announced across all of Europe, but in the UK, the 30 kWh LEAF Acenta starts from £24,490 (OTR with PiCG), and from £26,490 on the 30 kWh Tekna trim level. Additionally, the base LEAF (S trim) now comes with a standard 5" screen (as opposed to the "no screen" console found in the 2015 model), with the 7" screen in the SV and SL trims continuing in the new 2016 edition. 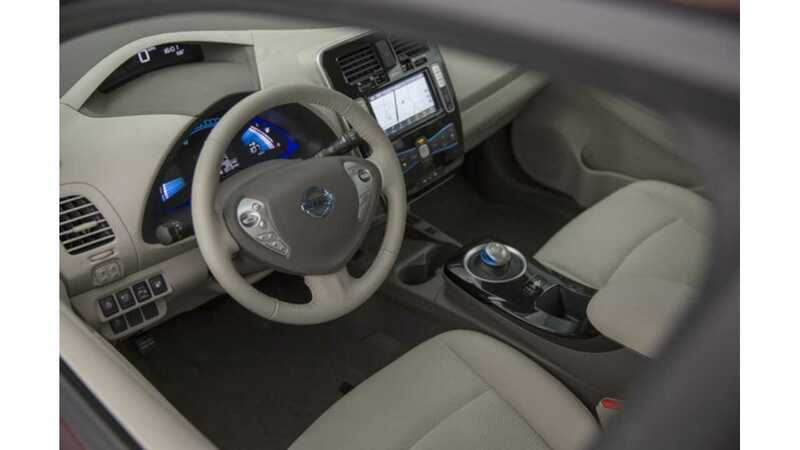 Nissan says the infotainment and connectivity features have been enhanced and improved for the 2016 model under the standard "Nissan Connect" banner. 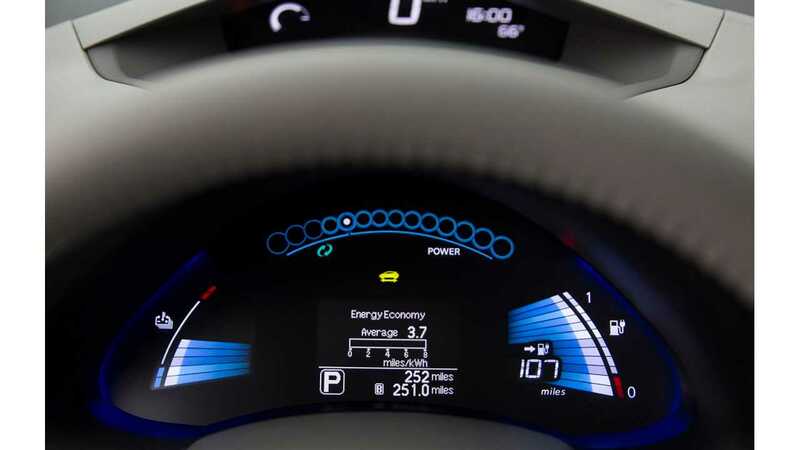 A new graphic interface is now found inside the 2016 LEAF, as well as charging screen data that is updated every time the car is put into use. 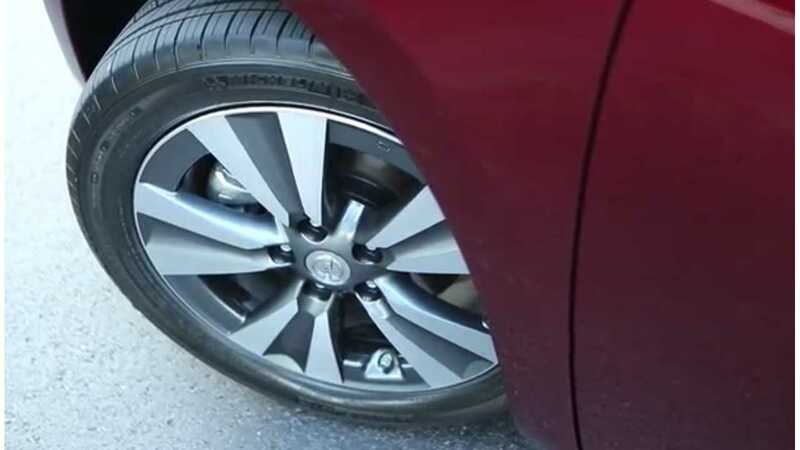 The Nissan Connect EV telematics systems allows for all the remote connection functions to the vehicle one would expect, but also touts improved voice recognition, and an improved mobile app. 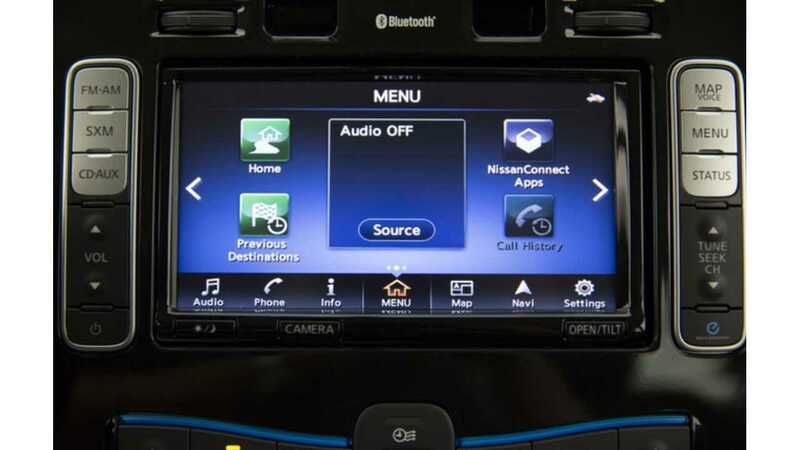 "Audio, entertainment and connectivity upgrades start with the addition of standard NissanConnect with Mobile Apps with 5.0-inch color display for LEAF S models. The system includes Bluetooth® Hands-free Phone System, Streaming audio via Bluetooth®, Hands-free Text Messaging Assistant and USB connection port for iPod® interface and other compatible devices. 2016 LEAF SV and SL grades add standard NissanConnect with Navigation and Mobile Apps–featuring a 7.0-inch color display with multi-touch control, Nissan Voice Recognition for navigation and audio, HD radio, and SiriusXM Travel LinkTM for weather, fuel prices, movie listings, stock info and sports (SiriusXM subscription required, sold separately). The menu screen graphics and customization process have been improved and charging screen information is now automatically updated every time the ignition is turned on and with every 12 miles of driving." 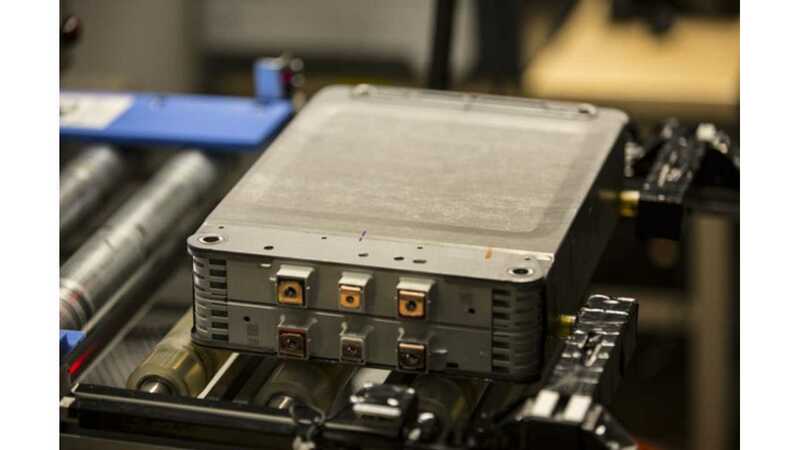 The 30 kWh battery resides in the same battery space under the LEAF as the existing 24 kWh pack, and weighs just 46 pounds (21 kg)more. "Improved electrode material with revised chemistry results in higher power density and enhanced battery durability upon charge and discharge." Basically, the introduction of Carbon, Nitrogen and Magnesium to the electrodes improves performance of the cells, while Nissan adds the "change to the cell layout also contributes to the gain", although we aren't quite sure how. 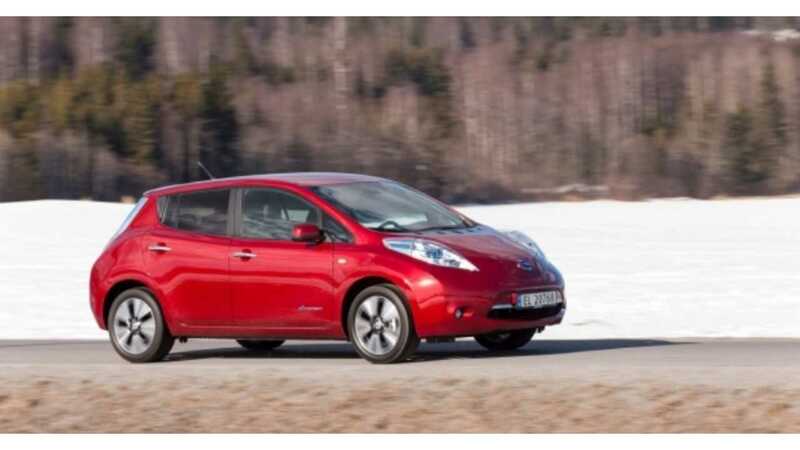 As evidence of a growing confidence in the 30 kWh battery's cell chemistry (and the fact it will now take less battery cycles to go further), Nissan warrants battery loss below 9 bars of capacity (70%), for the first 8 years or 100,000 miles (160,000 km) in the US and in Europe. 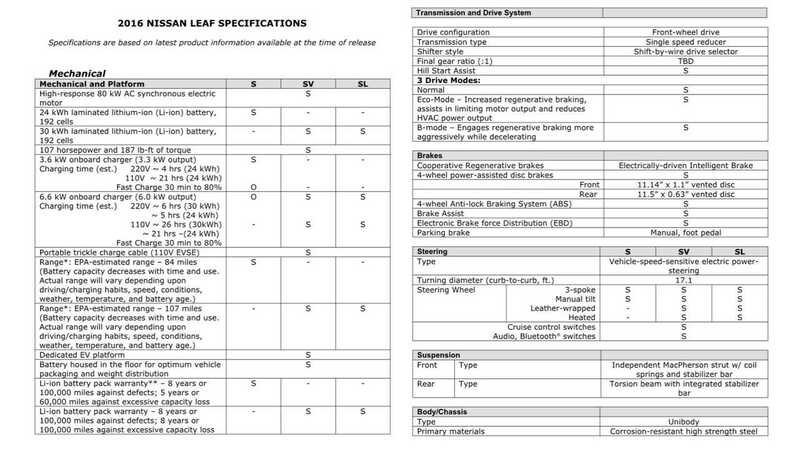 The warranty on the S trim stays consistent with that of the 2015 LEAF, at 5 years or 60,000 miles. As for the actual pack structure, the original 24 kWh battery is made up of 48 modules composed of 4 cells each, for a total of 192 cells. 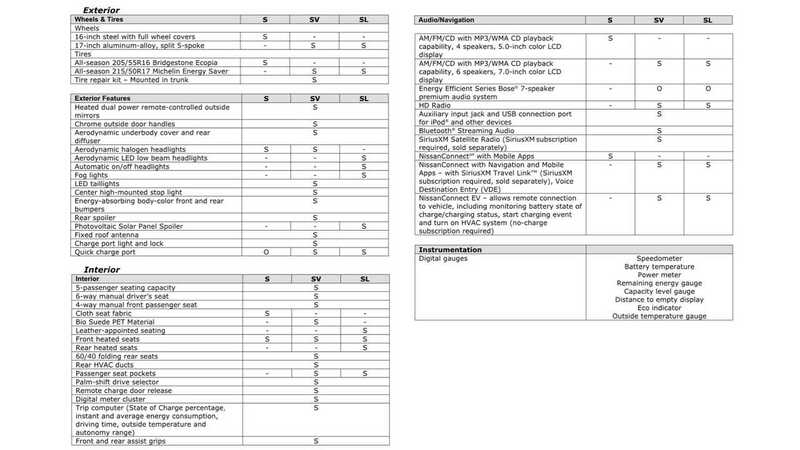 The new 30 kWh battery has double the cells per module (8), but still 192 cells in total. 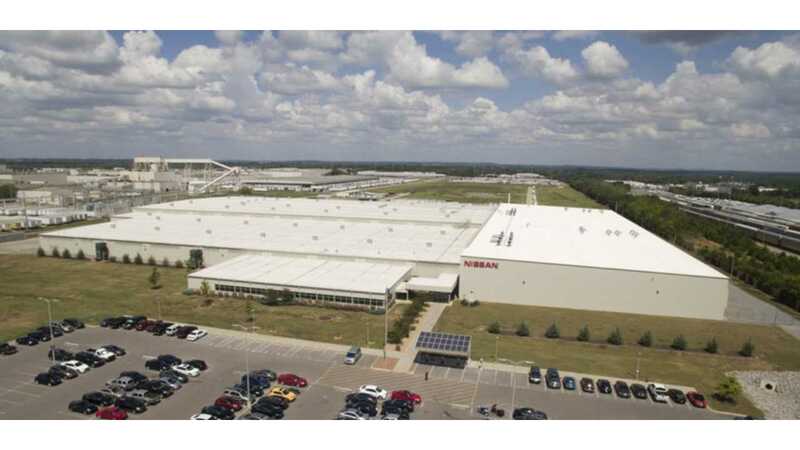 Nissan once again points to automotive-specific battery formats as a superior commodity. "Unlike conventional cylindrical batteries, the thin, compact laminated cells offer more flexibility in packaging and design applications." 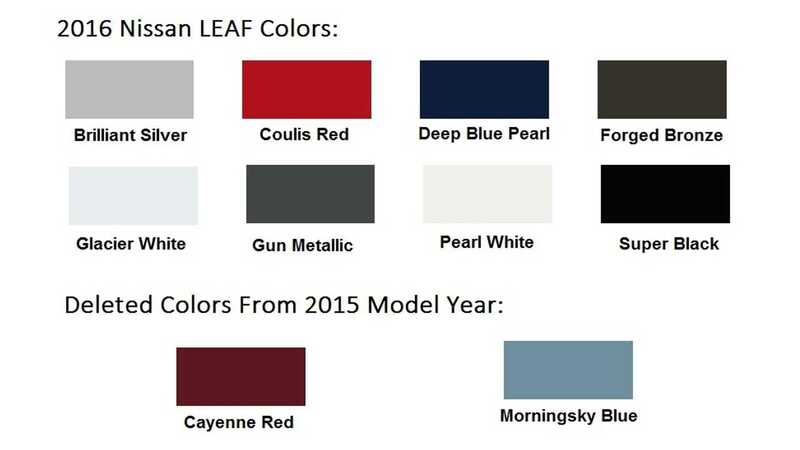 As expected, three colors have been added to the 2016 LEAF lineup, while two have left the building. The entry level LEAF S retains the same 84 miles of range as last year's model, as well as the 126 MPGe city/108 MPGe highway efficiency rating, which is good for a combined 114 MPGe. The LEAF SV/SL with 107 miles of range has a slightly lower city rating than the base model - registering 124 MPGe, and an identical 108 MPGe highway score, which lowers the combined rating slightly to 112 MPGe. 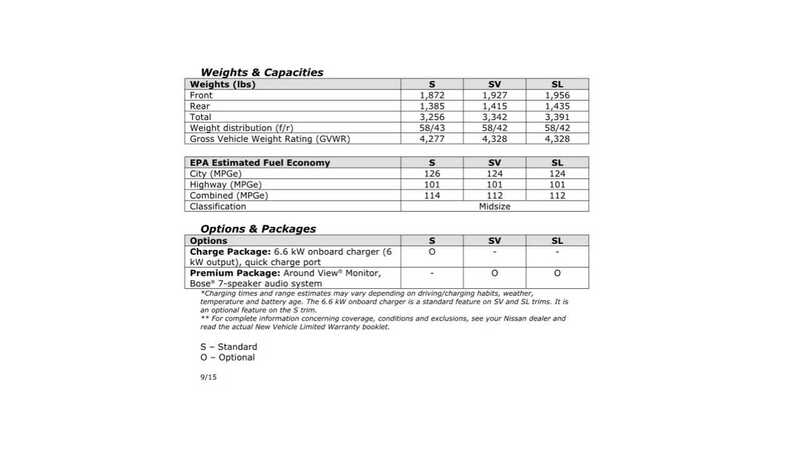 All three trim levels feature the same 107 horsepower and 187 lb-ft of torque output as in the previous model year, while the S trim level has an optional "Charge Package" that upgrades the base model to the same 6.6 kW charging (from 3.6 kW) as well as adding the CHAdeMO fast charging port that comes standard in the SV and SL trims. We also took advantage of a chat with Nissan earlier this week to pepper them about when the 2016 Nissan LEAF would be available, but all they would commit to was that the "2016 LEAF will go on sale later this fall". So somewhere between September 23nd and December 31st then Nissan? 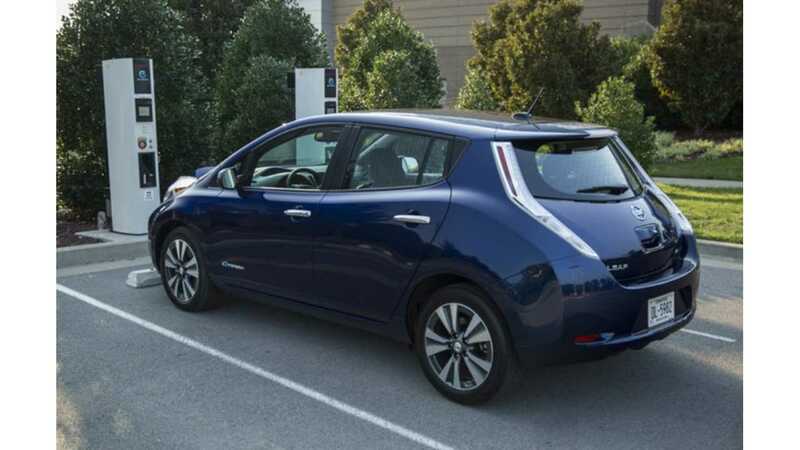 Our own sources indicate that 2016 Nissan LEAF production actually began in earnest in August in Smryna, TN, although mid-October seems to be when the 'sales ball' might get rolling for the 2016 LEAF. 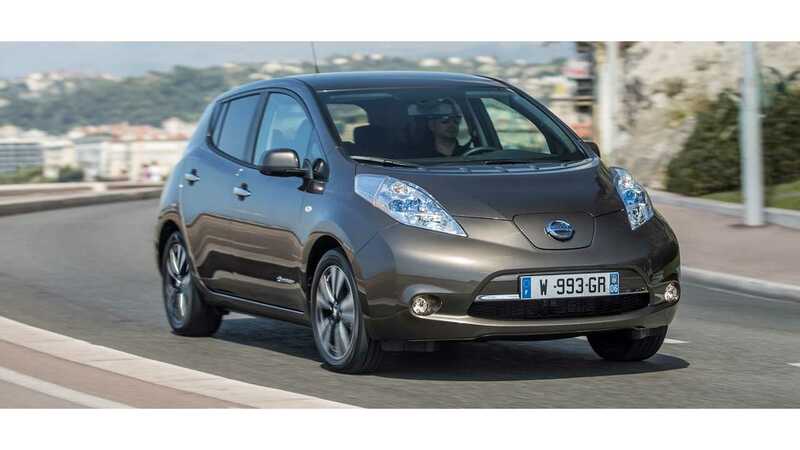 For Europe, the new, longer range Nissan LEAF will still be produced at the company's Sunderlank, UK facility, but sales begin a little later - in January 2016. * - Premium Package (SV and SL times) - adds Around View® Monitor and Energy Efficient Series Bose® seven- speaker audio. 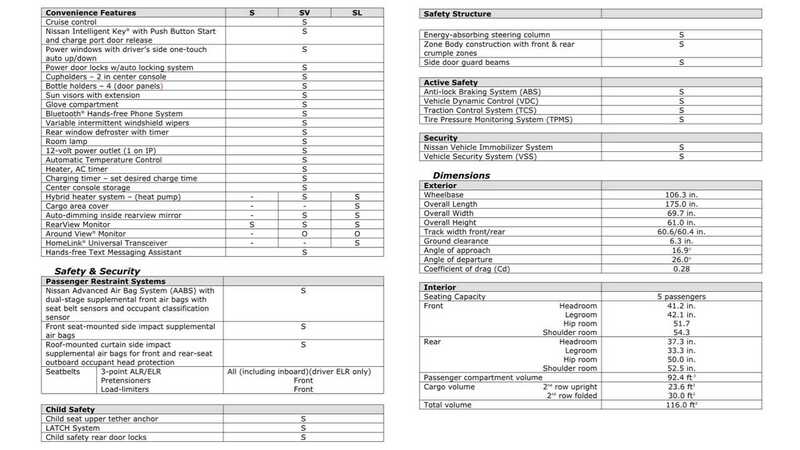 The majority of the changes you see here will also be found on your 2016 Nissan LEAF with a couple of exceptions. You don't get the "Forged Bronze" color option - which is ok, it is unlikely to be very popular because, well...it's brown. You will also be losing the "Glacier White" color option; although isn't "Pearl White" enough anyway? But, you do finally get the standard 17" wheels on the SV, like those of us in the US. Only the black interior is available. As it is significantly colder on average in Canada than the US, all LEAF models come standard equipped with a heated steering wheel and both heated front and rear seats. Editor's Note: This is not the next generation of the Nissan LEAF, but rather an upgraded version of the last model year of the first generation car. The all-new, next generation Nissan LEAF (with an estimated 170-200 miles of range) is expected to arrive in Q2 of 2017.